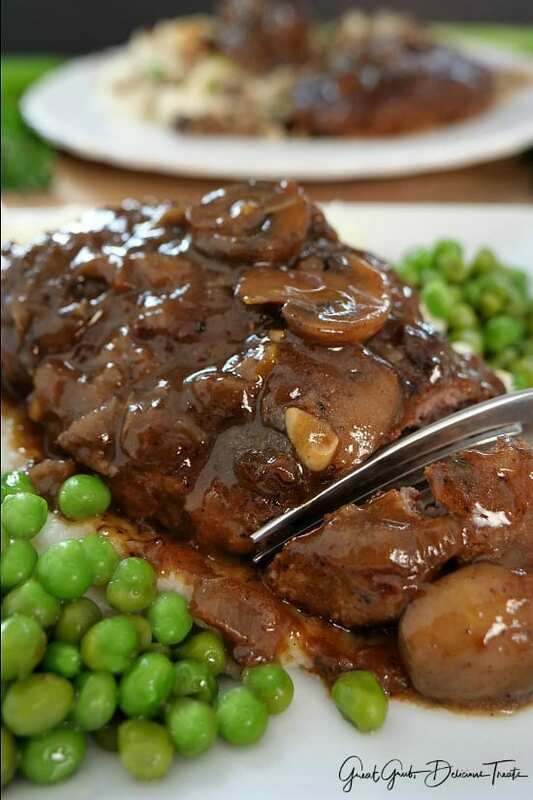 This Salisbury steak in mushroom onion gravy is a delicious homemade family favorite meal. Made with oval-shaped ground beef patties, pan seared and then cooked in a rich and savory, homemade, mushroom onion brown gravy. Good ol’ down home cooking and comfort food at it’s finest. A fairly quick meal to make that’s easy and delicious and can be on the table in about 45 minutes, depending on how long you cook the steaks in the gravy. 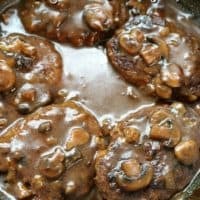 Ground beef patties pan seared and cooked in a delicious, savory, mushroom onion gravy that’s to die for, served over mashed potatoes and then smothered with more delicious gravy, what’s better than that? Oh, then served with a delicious vegetable on the side. A perfect comfort food and meal the whole family will enjoy! These Salisbury steaks are juicy, super flavorful and when served with mashed potatoes and a vegetable, are such a satisfying meal. You probably will not even need dessert after this yummy meal because it’s so filling. 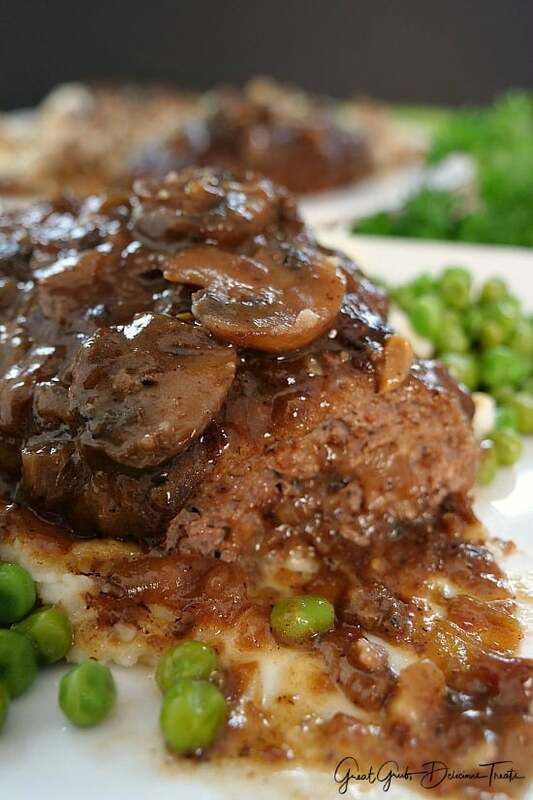 I love this Salisbury steak recipe with broccoli or asparagus as the side but decided to use peas today, mainly because I didn’t have either of my two favorites and I had just used corn in my chicken fried steak with country gravy recipe the other day. 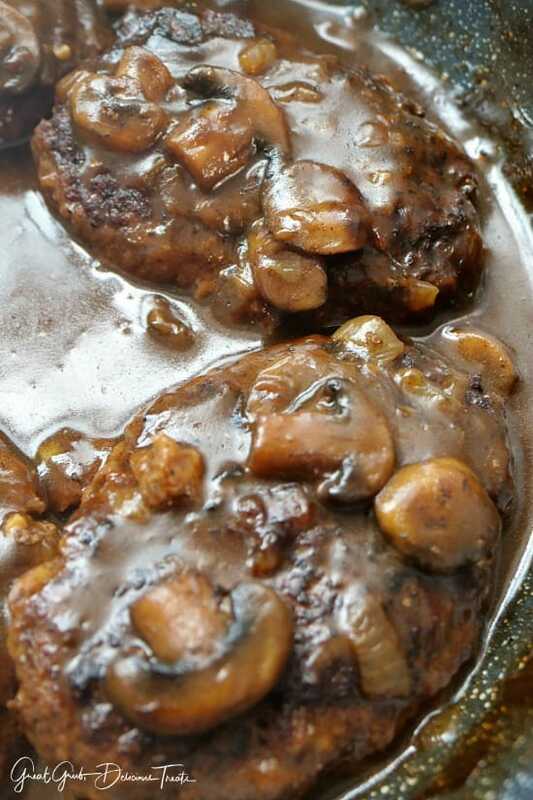 This Salisbury steak in mushroom onion gravy is easy to make. Grab a mixing bowl, and mix ground beef, onions, egg, bread crumbs, Worcestershire sauce, crushed red peppers, parsley and pepper together. Divide the ground beef into equal amounts and shape into oval patties about 1/2 inch thick. Should be able to get 5 or 6 patties out of this mixture. Heat a cast iron pan, or large frying pan, over medium high heat and cooked each patty for about 4-5 minutes on each side. Once golden brown and crispy on both sides, remove them from the pan and place on a plate. Reduce the heat to medium, add onions and garlic to the pan along with the drippings from the steaks, and cook for 3-4 minutes. Stir in mushrooms and continue cooking for another few minutes. Sprinkle flour into pan, stir and cook for another minute or so. Next, add the beef broth, stir for a few minutes and then place the Salisbury steaks back into the pan. Cover the steaks in the gravy mixture and let the juices from the gravy saturate throughout the patties, cover the pan and cook for about 20-30 minutes. The gravy will also thicken up as it cools. That’s pretty much it. Pretty easy, right? Now just get some mashed potatoes and a vegetable to serve alongside and you will have a delicious homemade comfort meal that is absolutely scrumptious. Who doesn’t love a delicious meal, whatever it is, when it’s smothered in gravy? 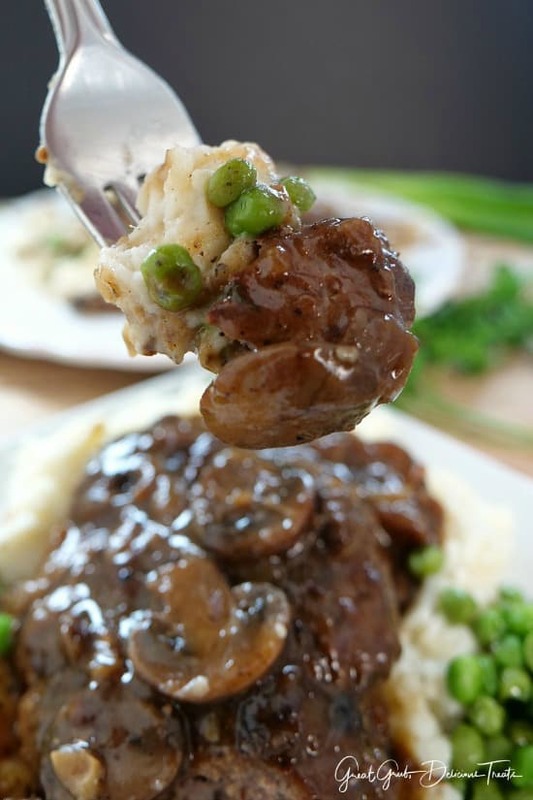 Well, this Salisbury steak recipe is definitely one you are going to love. 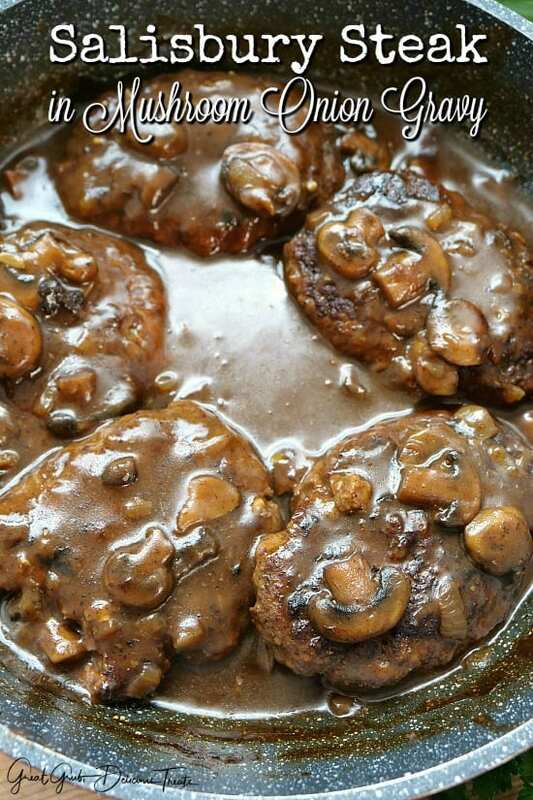 Ground beef patties smothered in mushroom onion gravy. Just plain yum! Here are a few more delicious beef recipes that you can find on the blog: Crock Pot BBQ Meatloaf, BBQ Dry Rub Tri Tip Steaks, Spicy Tater Tot Casserole, Bow Tie Pasta Lasagna, and how about a Million Dollar Pasta Bake? There are many more so make sure to check all of them out. 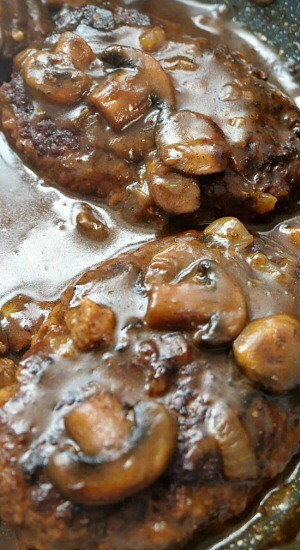 Delicious pan seared ground beef oval patties cooked in a mushroom onion brown gravy that tastes incredibly delicious. A family favorite. In a medium mixing bowl, mix ground beef, onions, egg, bread crumbs, Worcestershire sauce, parsley, crushed red peppers and pepper together. Divide into equal amounts and shape into oval patties about 1/2 inch thick. Should get 5 or 6. Heat a cast iron pan or large frying pan over medium high heat and cooked each patty for about 4-5 minutes on each side. Once cooked on both sides, remove from the pan and place on a plate. Reduce heat to medium, add onions and garlic to the pan along with the steak drippings. Cook for 3-4 minutes. Stir in mushrooms and continue cooking for another few minutes. Sprinkle flour over the mushrooms and onions, stir and cook for another minute or so. Next, add beef broth, Worcestershire sauce, salt and pepper. Stir for a few minutes and place the Salisbury steaks back into the pan and cover with the gravy mixture. Cover pan and cook for about 20-30 minutes gently stirring occasionally. The gravy will also thicken up as it cools so make sure not to cook it too long or your gravy will be too thick. If that happens, just add a little more beef broth to thin it out. Serve over mashed potatoes with a delicious vegetable. *And if the gravy seems to thin, mix 1 tsp corn starch with 1/8 cup water, then add to pan, stir and let simmer for a few more minutes. My grandmother used to make a similar recipe. I fogot all about it until I saw yours. I can’t wait to try it. 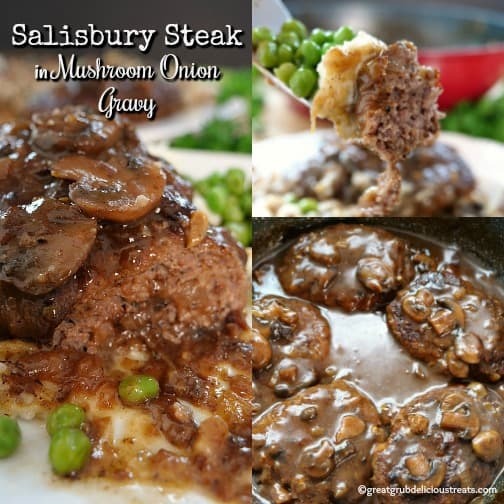 After searching for the best salisbury steak recipe – I’ve finally found the one I love most! Woo-hoo!!! The mushroom onion gravy on this is so darn scrumptious. This is definitely a recipe I’ll be making again and again! This really is comfort food at it’s best. 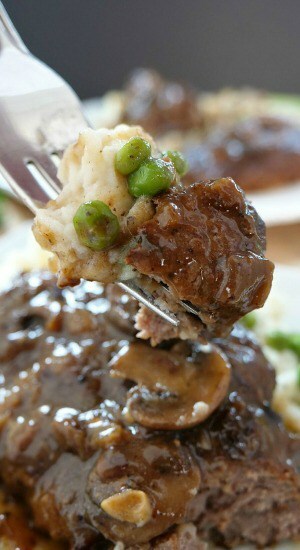 Your mushroom gravy recipe was delicious over the salisbury steaks! I’m going to try it, I live alone but I think I can make a small amount and still be good. Thanks for the recipe it came out great.